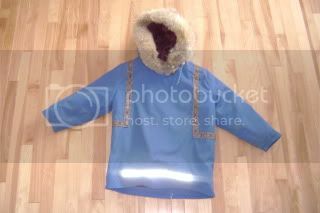 I was wondering if anyone knows anything about Inuit-made anoraks. We seem to be on a never ending quest here to pinpoint new sources of quality afordable anoraks. I was watching "passage" last night on the history channel, it was a great documentary about Franklin's failed expedition to find the NW passage and john ray's attempts to solve the mystery. Anyways they had alot of footage of modern Inuits showcasing traditional skills and sharing their knowledge of the events. I noticed that alot of them had anoraks that were probably cotton and most likely homemade. Most were navy blue or white and had the decorative trim ribbon. Some had fur ruffs around the hood. I tried searching on the net for an inuit store or something that might retail anoraks but came up dry. I realize the mothers and grandmothers probably make them locally. For anyone who saw the documentary they brough an Inuit man to london to tell the Inuit side of the story and he was using an anorak as a windproof layer while walking around london, it was a very nice navy blue anorak. Anyone seen these sold on the net? 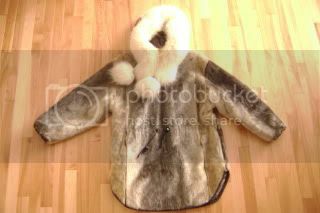 I lived in the Canadian Arctic for about 15 years and in that time I made several parkas for myself and my kids, some of which we still use here in North Bay when its real cold. The most common 'modern' parka has 3 layers so you basically have to make 3 parkas. The innermost layer is a slippery liner so the parka is easy to get on and off. This is sewn into the inside of a heavy wool duffel layer. This cloth is typically about 1 cm thick, quite stiff and fairly hard to sew. The next layer is the windproof outer parka. Most commonly this is made from a poly-cotton blend, often something called Commander cloth. In all my time there I only saw one parka made with a pure cotton outer. The outer layer is attached to the duffel layer using safety pins or such so that it can be removed easily for washing. The fur ruff is sewn onto the duffel layer because it is seldom or never washed. The outer layer is often decorated with braiding, fur, beads or whatever, people can get quite fancy. But a hunting parka is often undecorated. Some parkas are made without zippers as pullovers (anoraks- anorak means wind in Inuktitut- Anoraktuk='it is windy'). But many are made with front zippers, particularly womens parkas. I varied the 3 layer theme quite a bit. My best parka was made with an insulating layer of thinsulate and polar fleece. This was much warmer and lighter than duffel. Also 2 layers of polarfleece was a winner. However these required making 4 parkas rather than 3! 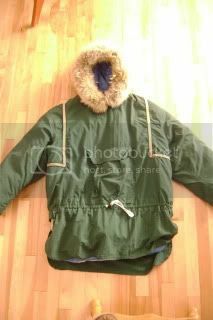 If you are interested MacPhee Workshop http://www.macpheeworkshop.com/ has what you need to make a parka or anorak. Their 'Parkover' pattern is very versatile and I have used it a lot. Thanks for the awesome answer. I was looking for a similar answer but wasin't sure what we would be able to figure out. I looked at that site and they do have the commander cloth you mentioned. Very interesting. I didn't realize the Inuit Anorak was part of an integral system that was so well though out, I just figured it was thrown over whatever layers they had underneath, but it makes alot of sense. What layers were worn under this modular anorak design? Regular long john shirt and a sweater? Thanks again for the answer. I'm tempted to make an attempt at putting on together. Do you have any pictures of the parkas you have made? I'm sure others would be as interested as I to see them. This kind of knowledge is worth more than it's weight in gold. If you're up in the north, it's not too hard to find what you're looking for. The local stores carry them in Inuvik and in a few stores in Yellowknife. I assume it would be the same in Iqaluit. There is a store in YK Centre that sells parkas, anoraks, mukluks, etc., but I am pretty certain they are not made by the locals. If that's not important, then they would be ideal, cuz they are less expensive than getting a local lady to make one, at least in most circumstances. A really nice option in more modern materials is Skookum brand, made by a lady in the Yukon. A bit more money, but sturdy and tough. 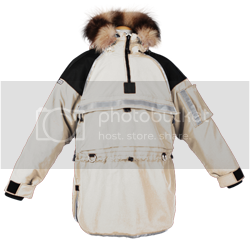 As Jimmy said what the Inuit in the communities use to make their parkas depends to a large extent on what is available at the Northern Store, and that can be fairly limiting. I never liked working with duffel cloth, because it is heavy for the insulation it gives and tough to sew because it has absolutely no give. So I tended to mail-order my materials. As to what is worn under the parka, that of course depends on the conditions. But I bet people would be amazed at the sheer amount of clothing that is worn in very cold conditions. Keep in mind that most hunters these days use snowmobiles so travel is a fairly sedentary activity, not active like running a dog team. There is absolutely no place colder than sitting on a qamutiq (sled) running at 70 kliks across the ice at -35 C.
So my hunting parkas were made oversized so I could fit lots of clothing underneath. In deep cold I would wear a lots of wool underwear, wool shirt, a fleece or two, then a "southern" winter jacket of the type I might wear all winter in North Bay, then the parka. This has the advantage that you can wear the jacket in the tent or iglu, or if you are working and generating a lot of heat, and still have a barrier against wind or snow. In warmer conditions we would wear less of course. But the clothing is always loose and non-constricting. 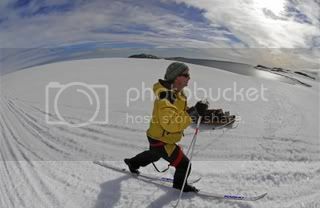 I also made insulated bib pants for use with the parka. Some people wear a full 'snowmobile suit' coverall under the parka and this is a good combo for some conditions. While in Alaska and taking AA meetings out to the inuit villages I learned that the men with the Polar Bear hide pants were great hunters. Then I had that lesson again when I read the Eskimos, about the ones in NorthEast Canada. I regretable didn't pay attention to their Anoraks, I never wore one till I made my own out of canvas. With my wool undershirt I am quite warm traveling or standing still. The Army issued me what was called Buffalo insulation. It was a heavy fleece for stationary soldiers to stay warm. It was short curly strands wound into a tight weave. The pants were of a good pattern because they had a zipper running both sides from toe to hip. With out sitting down and removing other layers (hard shell/ Gortex), you could take these insulatiing pants off. I never had a reason to wear them as a grunt. We wanted to sometimes standing around giving classes for our troops. I still have a top that my son wears and keeps with his cold wear. Has anyone done something similar with insulating layers (pants)? It wouldn't serve a purpose for the tops. I have deer skin leggins and shirts and one pair of Elk pants that are still usable. I just can't part with them. I should wear them at the next gathering I attend, cause I live in them at Rendevous! I find stories of everyone's time in the arctic region amazing. The farthest I have ever been away from atleast a house or small village is probably no more than 1-2 miles in the laurentians. Theres something about the barren emptyness of the arctic that is so interesting and adventureous, I'm convinced that inside any man is a desire to take on some sort of adventure and a far off place; I'm convinced that we weren't designed physically or mentally to spend 8 hours per day in an office stressing over non threatening issues. The Inuit are an amazing people and the more I learn about them the more respect I get for them. If any of you guys have more stories and insight about your time in the north it would be really interesting to make a thread in the general section to hear them. The anoraks sound very efficent, probably too warm for southern Quebec but it gives me some ideas for layering under my anorak. lonegreeneagle: The army layers you talk about are these http://cgi.ebay.com/ws/eBayISAPI.dll?ViewItem&item=350172737042 ? I got one of those shirts for my GF, it was brand new! When one is quite young the thirst for such adventure seems to be driven by an innate desire to prove one can, and later, when the eyes have dimmed a wee bit, the legs have slowed, and one's hair, what's left of it, has gone grey, the thirst for adventure seems to be driven by a desire to prove one yet can. Of course, I've met folk who never possessed the least desire to see what was over the next ridge, but I've ever and humbly numbered myself among those who, no matter the distance traveled or the adventures of the day, wish to make one ridge further before they sleep. Yes that's the "bear" or "buffalo shirt". Extremely warm for sedimentary use! I thought I saw one in your clothing purchase photos. The Anorak is primarily used for travel or in windy conditions for me. For standing around near a fire or just yakking with friends, Wool is my insulater. though I carry my Anorak should the wind come up or I decide to take a hike. when hunters have butchered hides! I'll got to meat houses for hides. they generally do a good job skinning since their customers want the meat! they will salt the hides and store them till end of season then sell them to tanners. I paid $7.00 to $12.00 a hide depending on it's size and condition. Pretty cheap start for a home tanned garment. very nice anoraks! those are the ones I had in mind, your son's is the "classic" model that I saw a few examples of in the documentary I was watching. Simple but reliable and effective! Wow! Nice! That green one is exactly what I'd like! Kinguq, beautiful stuff! I wish I was talented enough to sew a pillow... Something, I never wanted to learn when I had the chance, and haven't had the chance now that I want to. Jimmy, if you like that green one, check out Midnight Mushing Alaska (www.midnightmushingalaska.com)--they aren't Inuit made, but are Alaskan made. I've had one for a few years now--still looks new and is absolutely my favorite garment I own. I only wear it in single digits and colder. I put in many hours of overtime to afford it, but it's almost half the cost of the Skookum above.